If you only play one game about an undead marionette skeleton cowboy, this is the one. Microsoft is cramming Kinect control into just about everything it can, it seems, but one game in which it makes a bit more sense is The Gunstringer, an Xbox Live Arcade title from Twisted Pixel, due out this summer. In the game, you use Kinect to take control of a marionette - those are string puppets - who's out for revenge against the former associates that betrayed him and left him for dead. To resurrect your skeleton cowboy hero, you lift up your left hand as though you were lifting up a marionette. Once he's back among the living, you use your left hand to move him left or right, flicking it upward to make him jump. Your right hand controls the aiming reticule for your gun. Sweeping your hand lets you target several enemies - or spots on a bigger enemy - at once, then flicking your hand upwards actually fires. Adopting a fingergun configuration is not required, but certainly recommended for maximum coolness. The game is on rails, so you don't have to worry about your forward momentum, but getting your hands to work together so that you can dodge, take cover, jump, and fire all at once is surprisingly challenging despite the simplicity of the controls. Don't be fooled by The Gunstringer's sense of humor and cartoonish visuals - this game wants you dead (again), and is going to throw everything it can at you. The Old West of The Gunstringer feels like it brushed up against Grim Fandango; the visuals take more than a little inspiration from Dia de la Muerta style artwork. Which only makes sense, really, given that the hero himself is a skeleton. A skeleton sporting a bottle cap as his belt buckle, no less. Only a handful of levels were playable, so we only got to see a small taste of what the game has to offer overall. I was promised that you'll eventually get to use a shotgun, and that a second player can jump in at any point to help out with the combat. What I did play included a boss fight with Wavy Tube Man - yes, just like those things mattress stores use to promote a sale - a brief, 2d platforming section reminiscent of Donkey Kong, and a score-multiplying Killing Spree activated by eating a Taco. It was completely ridiculous, but in a way that made you want to keep playing so you could discover the next piece of sillyness. The control was quite forgiving, too, so the challenge came from your enemies, not from wrestling with the controller. The biggest hurdle for Kinect games so far is giving you a good enough reason to flap your arms around, but the satisfying difficulty and goofy fun of The Gunstringer might make you do it. These are the guys who made the equally absurd-yet-challenging 'Splosion Man, after all. The release for the game says it can be played seated, but we didn't get a chance to try that out. 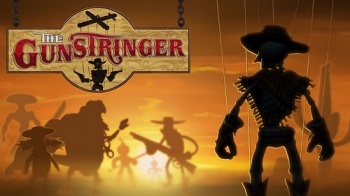 The Gunstringer will hit XBLA in September.